Rescuing Entangled Stellar Sea Lions – Neptune 911! Editor’s Note: The following is an excerpted report from the Times Colonist, “Human discards mean slow torture for B.C.’s marine mammals.” Highlighted portions by Neptune 911. Marty Haulena positions himself atop a federal fisheries patrol boat, his CO2-powered dart rifle aimed at a rocky haulout of about 200 Steller sea lions off Long Beach on Vancouver Island. His target is an adult female with a plastic packing band cutting through the skin and deep into the blubber around its neck. “A lot of things can go wrong,” the Vancouver Aquarium veterinarian says of the rescue mission. Humans may be injured by slipping on wet rocks or working around a wild animal weighing at least 300 kilograms. An anesthetized sea lion is also at risk of drowning should it leave the safety of the rocks and plunge into the Pacific Ocean. To do nothing also has its consequences — a slow and painful death for the sea lion. White-foam waves cascade over the barnacled rocks at noon as Fisheries officer Denise Koshowski guides the 7.3-metre inflatable boat ever closer to the noisy, nervous colony. At a distance of 20 metres, Haulena fires the gun and watches the dart hits its mark and then quickly bounce onto the rocks, leaving him uncertain if the animal received the full 4.6-millilitre cocktail of medetomidine, butorphanol and midazolam. The drugs take about 12 minutes to fully take effect, enough time for Haulena and assistant Chelsey DeColle to be dropped off on the other side of the islet so they can approach the animal from above and behind. The other sea lions shuffle quickly down into the water to form a synchronized herd of slippery bobbing heads in the undulating waves. One individual carries a “hot brand” from Rogue Reef, Ore. It’s a way for researchers to identify sea lions, including repeat offenders that target endangered salmon in the Columbia River. The darted female sleepily bobs its head but remains behind. Haulena works his way toward her, crouches down and successfully snips the packing band. …Another successful, if harrowing, rescue.Steller sea lions are named for the German surgeon and naturalist George Wilhelm Steller, who described them in 1742. Aquarium associate researcher Wendy Szaniszlo has helped monitor the species for years out of her base in Ucluelet. A total of 620 entanglements of Steller and California sea lions have been recorded off Pacific Rim National Park Reserve, mainly Barkley Sound, from 2005 to 2013. Allowing for duplicate sightings during surveys, the number probably represents about 335 individual animals, she says. About 38 per cent of cases involved plastic packing bands. Another 10 per cent involved commercial and sport fishing gear, five per cent rubber bands from crab traps, and for the rest debris was so badly embedded in the animal the type was unrecognizable. Over the past two years, the aquarium has successfully rescued a dozen sea lions on Vancouver’s west coast and near Fanny Bay, south of Courtenay in the Strait of Georgia. Today is the first time a journalist has been permitted to accompany the rescue team. It’s not cheap, at about $2,000 per expedition. The aquarium has received $45,000 from the Canadian Wildlife Federation and $9,000 from Clayoquot Biosphere Trust for its sea lion disentanglement project but that funding has now ended, leaving its future uncertain. Solutions will also require development of both a biodegradable alternative to the plastic bands and for humans to take responsibility for their actions: ensuring that plastic packing bands are snipped — just as you should for plastic over a six-pack of beer — and ensuring they are disposed of properly, not tossed in the ocean. Haulena takes up the thought: “We’ve never seen one get entangled. I don’t know if it’s completely random or they start nosing at it and playing with it then it slips on and doesn’t come off. Their hair prevents it from coming off at first, then as they grow it digs in and has a cutting action, sawing through the skin. During rescue missions, the team gives priority to females over males given their greater importance for reproduction, and Steller over California sea lions since the former is officially a species of special concern and the latter is not. …Despite the spectre of deadly marine debris, the B.C. 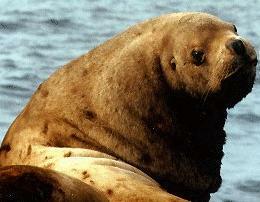 population of Steller sea lions continues to grow. A 2013 survey showed 6,089 pups and 22,300 non-pups, representing annual average increases of 4.6 per cent and 3.7 per cent, respectively, since 1971. The world’s largest Steller sea lion breeding colony is Triangle Island, off the northern tip of Vancouver Island, with 3,985 pups in 2013. On the whole west coast, Szaniszlo estimates one to two per cent of the population is entangled. Given the species’ upward trend, should the aquarium put its money into bigger conservation issues? “I know the vast majority of people want something done,” Haulena responds. “It’s a basic animal welfare issue. These animals are suffering because of something that is our fault.”Given the costs of getting out here, the crew is not content with one rescue. Several entangled animals were spotted on the rocks off Long Beach. One positioned itself well away from the others, an especially sad sight. “To see these animals entangled, your heart kind of melts,” Haulena confirms. Problem is, the crew gets only one chance per site, since the sea lions scatter and don’t readily crawl back onto the rocks. Under overcast skies, the two vessels head down the coast past Ucluelet to rocks off Wouwer Island, within the outer Broken Group. At about 3:30 p.m., Szaniszlo spots an entangled year-old male pup on a small clump of rocks from which the sea lions might easily take flight. • Males weight up to 1,100 kilograms and measure up to 3.1 metres; females, 300 kilograms and 2.4 metres. • Adults are mostly light tan to blond, darkening to a rusty brown on their ventral side, with dark brown to black flippers. Pups are born with blackish-brown fur that lightens until adult age at three years. • Distribution is from Southern California to Japan, including the Bering Sea, with breeding on 55 to 60 rookeries and resting on more than 300 haulouts in their range. • Females become sexually mature at three to six years and give birth to a single pup, which is able to swim shortly after birth. Only 60 to 65 per cent survive the first year. • Breeding sites in B.C. include the Scott Islands off northern Vancouver Island; Kerouard Islands off southern Haida Gwaii; North Danger Islands in Hecate Strait; Virgin Rocks in eastern Queen Charlotte Sound; Garcin Rocks off southeastern Haida Gwaii; and Gosling Rocks west of Bella Bella. • Steller sea lions, also known as Steller sea lions, feed on more than 50 species of fishes and invertebrates, especially herring, hake, sand lance, dogfish, eulachon, sardine and salmon. • The population in B.C. has increased four-to-five fold since control programs and commercial hunting ended in 1970.